Color Control Cabinets, CCC These Verivide daylight cabinets offer standardised viewing conditions for the assessment of colours, ink weight, register and dot gain. Light cabinet, Verivide, CAC 120 The CAC 120 light cabinet is essential for optimal and consistent colour assessment and quality of products up to approx. 100 cms. wide. Light cabinet, Verivide, CAC 150 The CAC 150 light cabinet is essential for optimal and consistent colour assessment of large size materials and products. 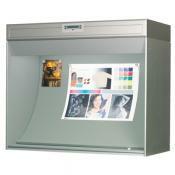 Light cabinet, Verivide, CAC 60 The CAC 60 light cabinet is essential for optimal and consistent colour assessment of your products up to 45 cms. wide. Light cabinet, Verivide, CAC-LED 120 The CAC-LED 60 light cabinet is essential for optimal and consistent colour assessment of your products up to 100 centimeter wide. Light cabinet, Verivide, CAC-LED 60 The CAC-LED 60 light cabinet is essential for optimal and consistent colour assessment of your products up to 45 centimeter wide. 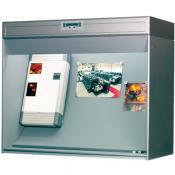 Light cabinets, Verivide, SBS VeriVide, Side By Side Proof Viewing Cabinets. Created in collaboration with PIRA and in accordance with International standards.